The T-fal Classic Avante 2-Slice Toaster features an angled design that you don’t see in other toasters. Because it is angled, removing the toast is a lot easier. It’s also easier to sneak a peek and see how your toast is doing. Another interesting feature is that the slots are adjustable so you can set them to the right width for the item you’re toasting. Thin bread, thick bagel… No problem. In fact, the T-fal Classic Avante has a bagel feature that makes it easy to make a perfect bagel without burning it. The T-fal Classic Avante also has a convenient reheat feature that will let you warm things back up without overheating them. The exterior of this toaster is cool to the touch so you don’t have to worry about burning yourself. There is also a removable tray to allow you to dispose of bread crumbs easily. When we first started researching the T-fal Classic Avante 2-Slice Toaster we went to Amazon.com. At the time of this writing there were 192 customer reviews on that website with an average user rating of just 3.9 stars. 3.9 stars is not anything to write home about but when we found this toaster on some other websites, we also found some more positive reviews to go along with it. For example, at the time of this writing there were 111 reviews for this toaster on Walmart’s website and it received an average user rating of 4.5 stars on that site. Overall, we found over 350 customer reviews for this toaster and it received an average user rating of approximately 4.25 out of a possible 5 stars. Now things are looking quite a bit better for the T-fal Classic Avante 2-Slice Toaster. But we’ll start by talking about some of the complaints that people who left negative reviews had and then we will talk about some of the positive reviews and what people like about this toaster. A lot of the people that left negative reviews said that this toaster is not able to toast things evenly. Some people are saying that the tilted design that is supposed to make it easier to remove toast from the appliance, results in a toasting pattern that follows the tilted design of the toaster. People are saying that one corner of the toast is much darker than the other corner. Now onto some of the positive reviews. A lot of customers are commenting on “all the cool features” that this toaster has. People are saying that they love the bagel setting and several customers also said that they like the extra lever that lets you pop up smaller pieces of bread. Several reviews came from people who said the T-fal Classic Avante is the best toaster they have ever bought. This toaster is also inexpensive so a lot of people are saying that they felt they got a great value for their money. Although there are a number of negative reviews, the positive reviews outnumber the negative reviews by a pretty wide margin. With an average user rating of 4.25 stars, it is clear that the majority of people are happy with this appliance. 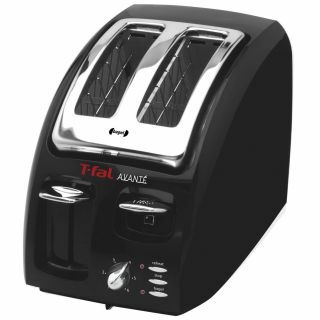 So although some people have problems with it, many more are saying that the T-fal Classic Avante is the best toaster they have ever used. And because of that, we would give the T-fal Classic Avante 2-Slice Toaster our recommendation to anyone who is looking for an inexpensive, two slice toaster.